← Quick Fix: Outlook 2010 Forward as Attachment? So in the last chapter we had run the SBS BPA and gotten a list of all the fixes it recommended we apply, and also the major updates missing. Starting randomly on the list i am going to fix the EDNS issue first. There probably numerous blog posts and resources on this, not to mention the fix itself is detailed for you in the BPA result. From a Command Prompt, simply enter : dnscmd /Config /EnableEdnsProbes 0 (thats a zero) then you can restart the DNS Server service to resolve that issue. Next, SBSMonitoring Service is not set to its default value. If we look further down you can see that i haven’t actually run the monitoring wizard on this server yet, ill run that now which should take care of both of those issues. You can find the wizard in the server management console, Click on Start, then Server Management, find Monitoring and Reporting in the console, and then to left of the screen is the option to Setup Monitoring and Reporting. The wizard is straight forward enough and does not need detailed explanation here, when completed you can open up the Services console, Start, Run, Services.msc and then scroll down to find the SQLAgent$SBSMonitoring service, you can see that it is now running and set to automatic start-up. 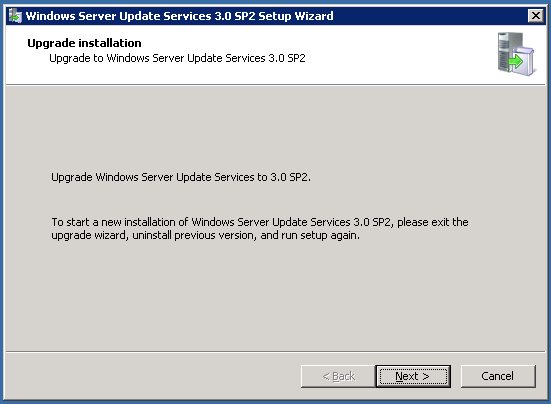 Windows Server Update Services 2.0 is running, WSUS 3 is available. 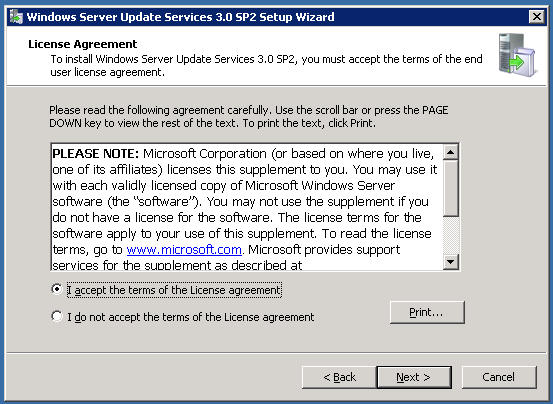 A bit more involved this one, follow the link to the TechNet article detailing how to install WSUS 3. 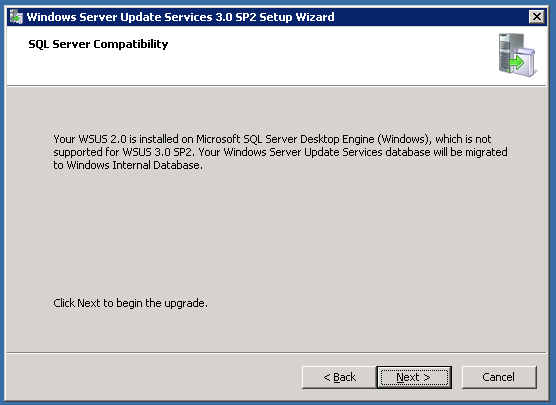 Reading the prerequisites on upgrading WSUS i can see that it advises not to do this, if the update services show a Blue Shield, this condition can be caused by a few things, one of the most common being if you have customised the WSUS Settings. A KB exists for repairing these settings, so you might need to review that first if you have a blue shield condition – looking at my BPA i do have this, but because my WSUS has not been configured at all. Running the file i am prompted to confirm i want to upgrade rather than perform a clean install (requires uninstall of version 2) clicking next, i need to accept the license agreement. 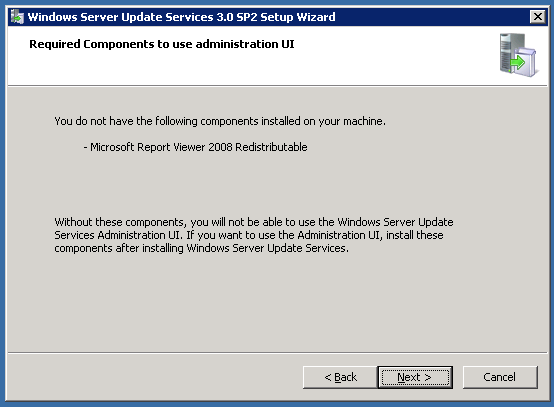 I am warned i don’t have the 2008 version of the Report Viewer, in this case it isn’t a big deal as i don’t plan to to view many reports on the server once it is migrated. 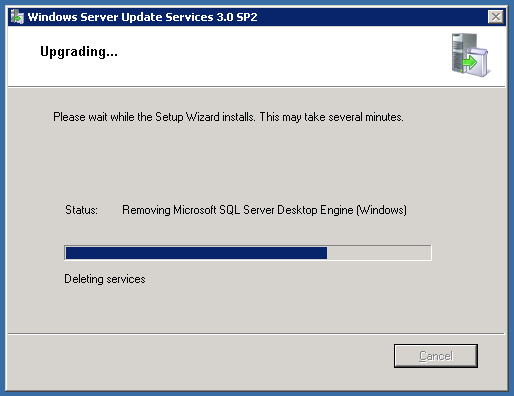 Interesting point you could wonder why i am bothering to do the WSUS upgrade if i am migrating? 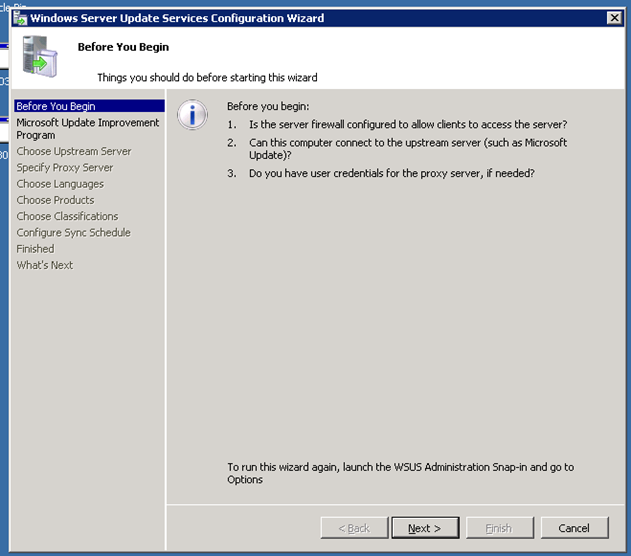 Well the simple answer is i want my server to be as up to date and ‘supportable’ prior to the migration beginning, and that means i need to do the WSUS upgrade! Clicking next will begin the upgrade process. If like me you’re running this over an RWW session you may be cut off several times during the process as services are restarted. Sit tight, give it some time and hopefully you will log back into see this! 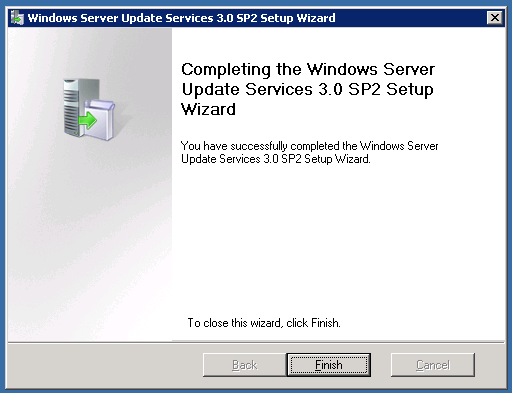 Now, when you click finish you will be presented with the WSUS Server Configuration wizard, in SBS Land we usually love our Wizards, in this case we do not! Click Cancel. Next we will look at installing the patches for Vista, and Office 2007 compatibility, working towards installing SP2 for Windows 2003.